The restaurant Lol Hawaiian Grill is kind of hard to find, hiding in a strip mall at 9460 S. Union Square in Sandy. The inside is very clean, with bright colors and welcoming music. The smell of slow-cooked pork is enticing as soon as the door is open. There isn’t room for many people with less than a dozen tables, and the kitchen is visible right behind the register. In addition to raving about the food, almost everyone on the first page of Yelp reviews talked about how nice everyone who works at the restaurant is. “You’re treated like family when you come here!” BJ Minson, a regular, said. LoL Hawaiian Grill always offers the basic dishes: barbecue chicken; kalua pork, which is slow cooked until tender; kalbi ribs, a Korean-style dish that is very popular in Hawaii; and garlic shrimp. But if diners want loco moco — rice, a hamburger patty and an egg — they have to come in on a Wednesday. “We find that people look forward to those specials on those days,” Toleafoa said. “We also make Polynesian dishes, you know, we don’t just focus on Hawaiian,” she said. “What we do have are very popular and people love what we make.” An example of a Polynesian dish they serve is Samoan oka, which comes with traditional Hawaiian poke. Both are made of raw fish, cured with some form of acid, much like Peruvian ceviche. Lana and Lopi were both born in Tonga and lived in New Zealand before moving to Hawaii and ultimately to Utah when their daughter Juanina was accepted to Brigham Young University-Idaho. Lana and Lopi Toleafoa, owners of LoL Hawaiian Grill. Food trucks have come a long way in recent years. The mobile restaurateurs of today are shedding the “roach coach” moniker and moving toward haute cuisine. 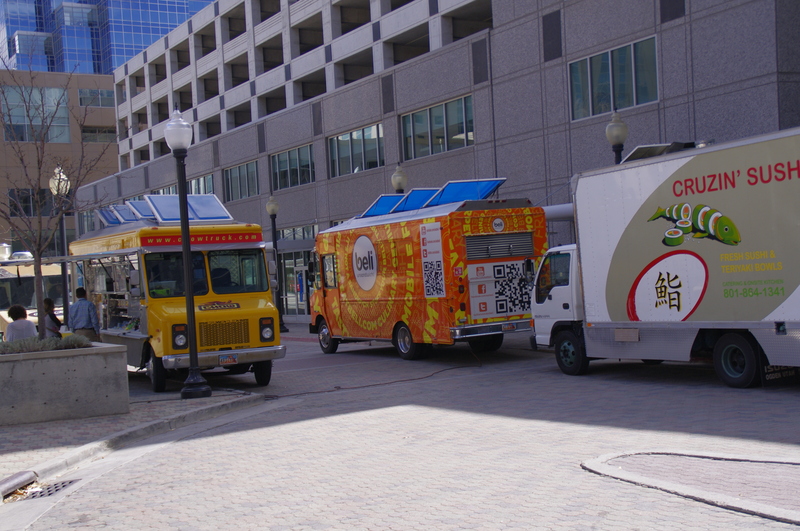 Since 2010, SuAn Chow has been at the forefront of this movement in Salt Lake City with her blazing yellow Chow Truck, where she serves up her unique brand of fusion cuisine. 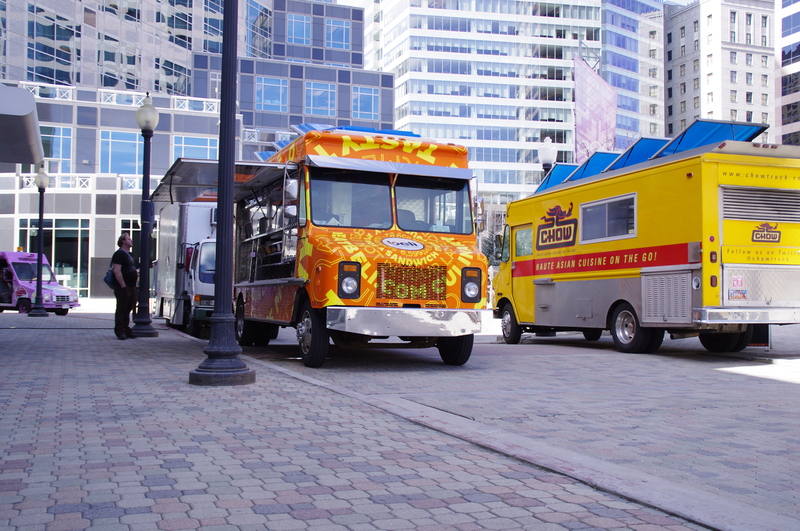 The Chow Truck’s menu includes tacos, sliders and salads infused with flavors from Asia. Panko-crusted tofu, coconut lemongrass chicken and pineapple ginger pork are some of the mainstays of the menu, and Chow offers them in the above-mentioned familiar forms. Xiaoyuay Lou, a visitor from New York who was in town for the National Association of Corrosion Engineers (NACE) Conference, stopped by the Chow Truck while parked at its weekly spot at the Gallivan Center in downtown Salt Lake. “The sliders are really good – they’re delicious,” Lou said. Chow’s flare for blurring the lines between different regional cuisines must have come from her upbringing. She is a second-generation Chinese-American, born and raised in Salt Lake City. Growing up, her parents owned a restaurant that featured Polynesian themed décor and a menu with both Chinese and American dishes – similar to the campy Trader Vic’s, a legendary California-based franchise popular in ‘50s and ‘60s. These are some of the foods she grew up enjoying because her family spent a lot of time at that restaurant, Chow said. But in 1985, she started her own restaurant, Charlie Chow’s, in downtown Salt Lake. It was her way of providing a venue for her father to cook traditional Chinese dishes, which is what he made for the family at home. “I wanted to rescue my father from his restaurant, which was a dying concept,” Chow said. She noticed the general public was becoming savvier about food and travel and saw a market for authentic Chinese food in Salt Lake. “We did black bean mussels and clams. I was the first to offer dim sum as appetizers on the regular menu,” Chow said. Her father died of colon cancer about a year after the opening of Charlie Chow’s, but she held on to the restaurant until 1993. After she sold the restaurant, Chow moved to New York to explore new career paths. She was the director of creative services at Joseph Abboud and later sold real estate in Manhattan. Even during her hiatus from the restaurant business, Chow kept an eye on evolving trends in the food world. In the late 2000s, she was reading about the food truck scene in Los Angeles and decided to head west to see what the hype was about. The Chow Truck has been in business for just over two years and already has garnered awards from City Weekly and Salt Lake Magazine for its distinctive offerings. But all the accolades haven’t come easily. 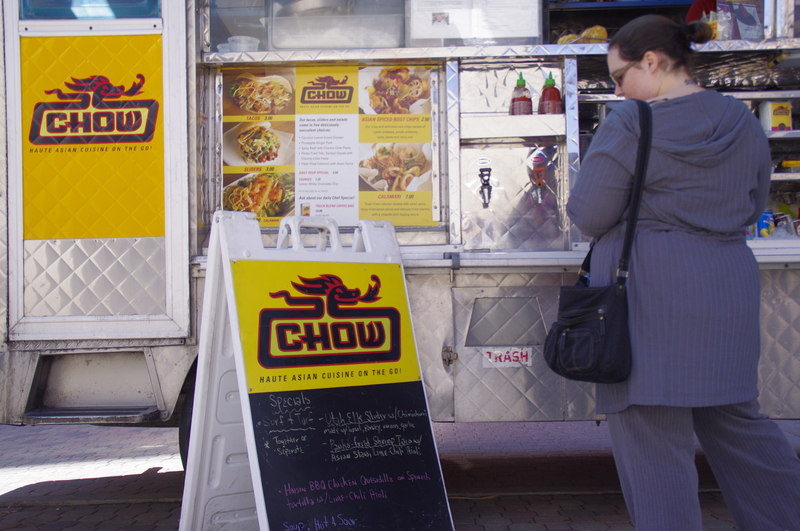 Operating a food truck can be harder than running a brick-and-mortar restaurant, Chow said. With the mobile model, she has to battle the elements and stay on the move to comply with city ordinances that won’t allow mobile food services to stay in one location for more than two hours. Technical difficulties aside, Chow’s truck has allowed her to connect with her customers and community in a way that’s not possible with a traditional restaurant. Because of how the food truck is set up, with its large bay windows, Chow and her kitchen staff are able to gauge diners’ responses immediately. “I always tell my kitchen staff that I’m offering them a kitchen with a view,” Chow said. There is no full-time chef on board the Chow Truck. Instead, Chow relies on a steady rotation of local chefs to craft special items. 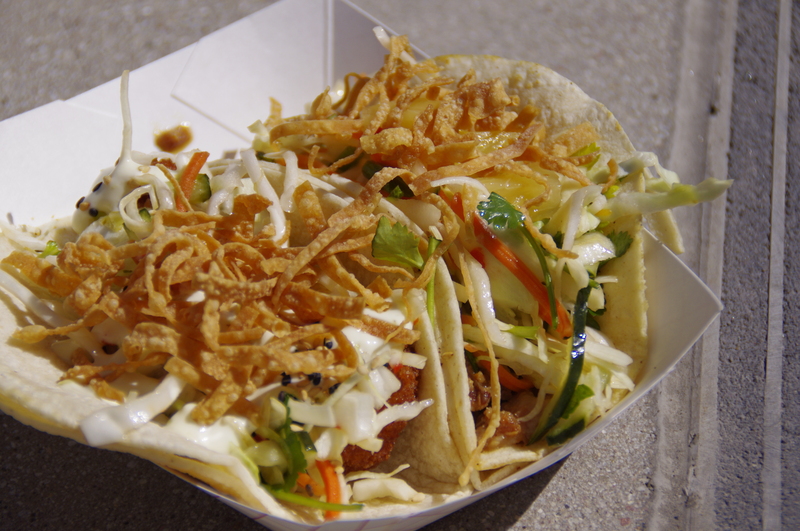 Past collaborators include Ryan Lowder of The Copper Onion, who contributed a pork belly taco, and Takashi Gibo of Takashi, who gave the Chow Truck the tako taco – tako is the Japanese word for octopus. In March, the Chow Truck is featuring a Utah elk slider with himichurri sauce by Ethan Lappe of Cafe Niche. 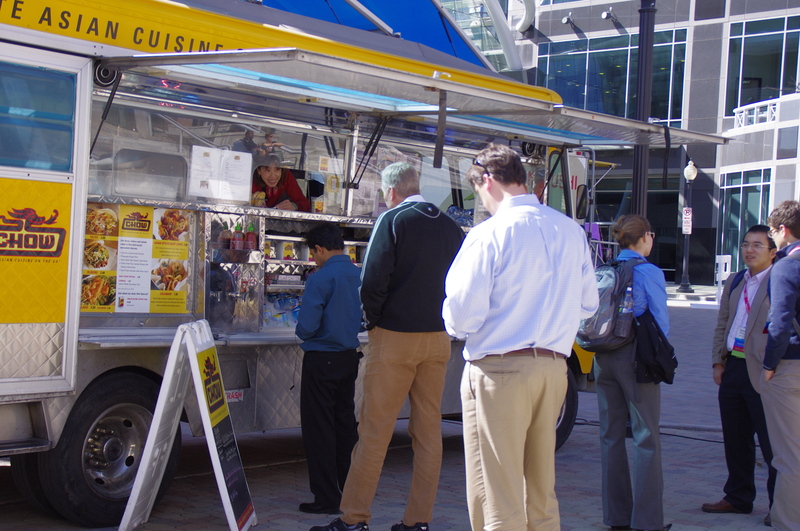 A first-time customer who was lured in by the intoxicating aromas permeating the Gallivan Center seemed impressed by the Chow Truck. That kind of reaction keeps Chow motivated. “Being able to hear people respond to the food is very gratifying,” she said. West Valley City is fast becoming one of the most ethnically enriched communities in Utah. With the number of different cultures and their businesses increasing in the city, some may think it will cause some competition between the communities. But the opposite has actually occurred at 1824 W. 3500 South. Tenochtitlan Market, a Hispanic grocery store, and Super Saigon Oriental Market, are a perfect example of this collaboration. Tenochtitlan and Super Saigon have been doing business in the same plaza for more than seven years. Many people say the association between these two businesses is unique, because it does not exist in many other cities. The Hispanic and Asian markets in other places are usually not found in the same plaza. Acela Ceja, the office manager and president assistant of Tenochtitlan, said there is no competition between the two markets. In fact, they work together to provide the best service for all the customers who come to this plaza. She also believes it is very convenient for customers to have these two markets so close to one another. Mayor Dennis Nordfelt of West Valley City believes that although the situation was unplanned, it has evolved into a positive business collaboration. “It demonstrates that these two communities can get along and benefit from each other,” Nordfelt said. He also said in other cities various cultures seem to be separated into different parts of the neighborhood. For instance, Hispanics are clustered in one area of the city, while Asians are located in another. However, ethnicity is disbursed all over West Valley City. 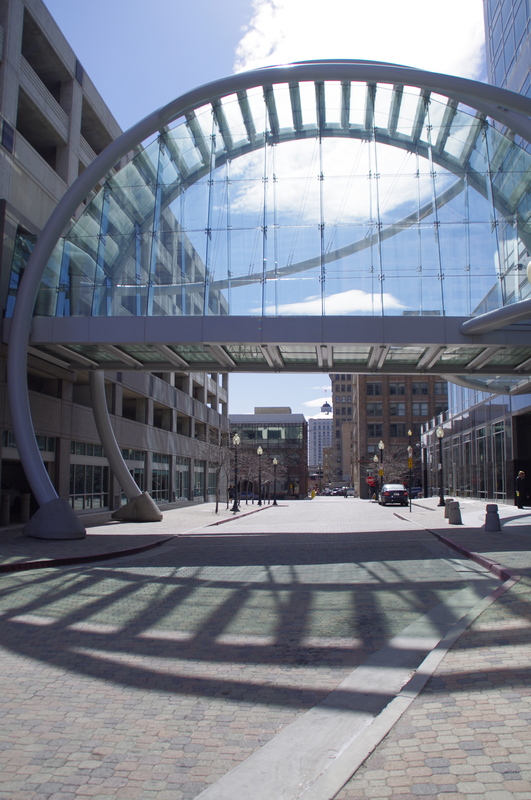 “I see Utah as a state and West Valley City in particular, as very welcoming to all ethnic minorities,” Nordfelt said. 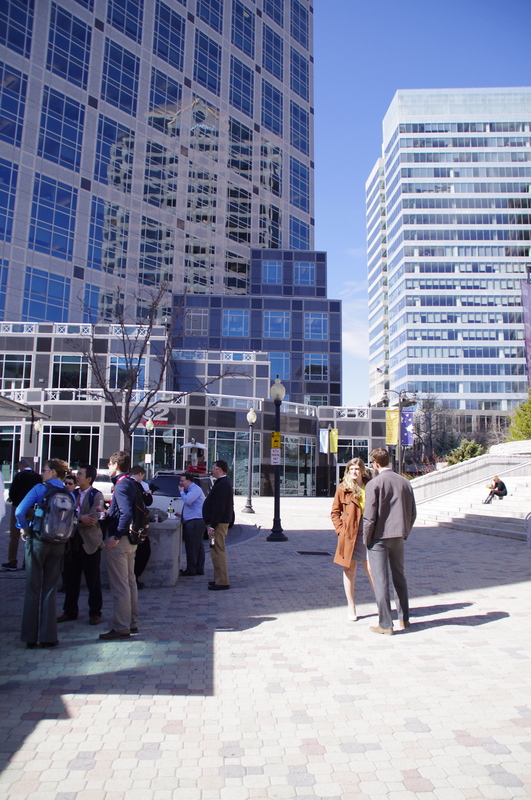 Furthermore, the plaza creates a richer community, said Pamela S. Perlich, the senior research economist of the Bureau of Economic and Business Research at the University of Utah. Having these types of businesses in the same area means there are more points of view and many more ideas and cultures, which ties the city to the rest of the world and create a more cosmopolitan community, she said. 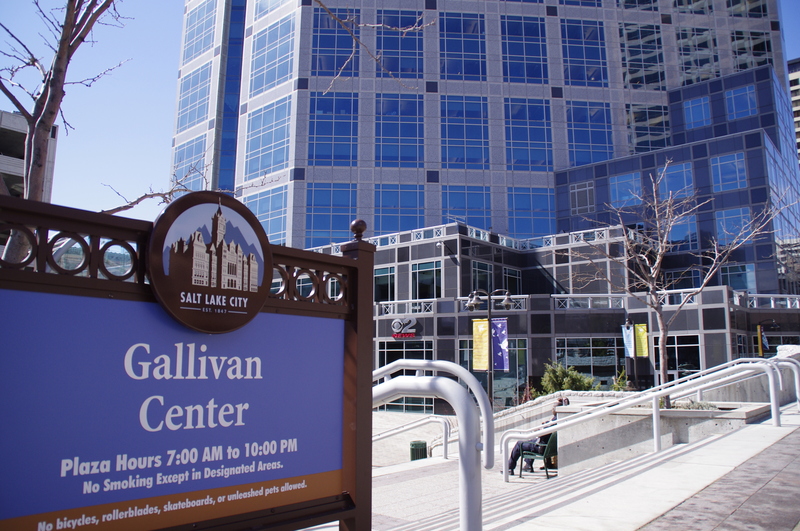 In addition, Perlich said Utah has attracted a lot of business talent from all over the world and the concentration of people from so many diverse places into one area has never been seen before. Although there are those out there that assume there are just too many differences between the two cultures for it to work, Perlich believes otherwise. “Sometimes differences in opinion and differences in ideas can bring a new synthesis of doing things and that is one of the benefits this community brings to Utah,” she said. According to the demographic census data done in 2000 by Perlich, of Utah’s 2.2 million population 238,667 was made up of Hispanics and Asians, and she presumes that their numbers have been steadily increasing over the last eight years, although the exact numbers will not be known until the 2010 census. The growth of the Hispanic and Asian population created the need for the Tenochtitlan and Super Saigon markets, therein creating the unwitting collaboration. Perlich also mentioned that Utah has been plugged into the internationalization of markets. She referred to the theory “Internationalization is our best hope for world peace,” from Thomas L. Friedman’s “The World is Flat.” These two markets are a great example of this theory being applied to the actual economy. Mayor Nordfelt agrees with this theory as well and said history itself proves it. He talked about how in the past people marginalized Hispanics and Asians because they were so different. And although it still happens, it is less frequent in West Valley because of the increase in their populations. “As their numbers have grown it just seems like we have been able to take the best from the minority cultures and the majority culture and put those all together for a new culture,” he said. Moreover, customers have indicated that this association has created a better understanding between the two communities. Muoi Ha, 55, a resident of West Valley City for 24 years and a longtime customer of Super Saigon, said she has seen a difference in the way people interact with each other. “I’ve been shopping in this area for over 10 years and I notice that people are nicer and respect each other more,” Ha said. She also said an area such as this did not exist before; people of different cultural backgrounds shopped in their own areas. Ha gave said when she and her family came from Vietnam to Utah in 1980, they sought out markets in Asian areas of Salt Lake City, because it was a comfort and language issue as well as a convenience factor. She did not want to have to travel to so many different markets and be around so many different people. Yet, she said when these businesses opened in the same plaza things began to change. After a few years, the comfort and language issues were not as apparent as before. She said even though the people who did business as well as shopped in the plaza did not speak the same language it did not stop them from working together and being friendly to each other. Ha said it gave her a different perspective on things. “It’s been a really good learning experience for me and my family,” Ha said. She also said it is very convenient, because if they needed to get something from both the Asian and Hispanic stores, they would only have to drive to one location. Ha said when they were finished shopping at one market, they would only have to walk next door to the other market and could finish all their shopping in one stop. Super Saigon Oriental Market is located on the west side of the plaza. Inside the market, people can find freshly roasted ducks and pigs, and deli sliced and prepared meats for Asian entrees like pho, a popular Vietnamese noodle dish. Desserts like che, a Vietnamese version of pudding using either coconut milk, different kinds of beans, tapioca, sweet rice and/or various types of fruit and a bountiful variety of Asian snacks from shrimp chips to durian crème wafers can also be found in the market. On the east side of the plaza is the Tenochtitlan Market, inside people will find a deli and bakery where customers can buy flan and tres leches cake, which literally translates as, “cake of three milks.” It is made out of three different kinds of milk: evaporated milk, condensed milk and either whole milk or cream. People can also find a variety of different Hispanic drinks and snacks. Also, to provide convenience for customers, service centers located in the store such as Sprint and Cricket. Nevertheless, people cannot really capture the true vision of this unique association until they see it for themselves and experience the diversity that is the Super Saigon and Tenochtitlan collaboration.